​The Technology Lab at Stanbridge Academy provides a place for direct instruction on the effective and responsible use of technology. Beyond the lab, technology supports and extends student learning, helps mitigate learning challenges, and enables teachers to create dynamic and engaging lessons. Our staff receives regular professional development on using technology in the classroom, and our Director of Educational Technology, Justin Silbaugh, also offers training workshops for parents/guardians who want to learn more about the programs their students are using at school. Stanbridge has made significant investments in infrastructure, equipment and staff training in order to thoughtfully integrate technology tools and resources throughout the school curriculum. Teachers use technology to create engaging and dynamic lessons that extend student learning, as well as provide assistive, individualized support for students with learning differences. Teachers work with students across disciplines and grades throughout the school year to build skills such as digital leadership, online literacy, web-based search and research, word processing, and delivery of effective presentations, among others. 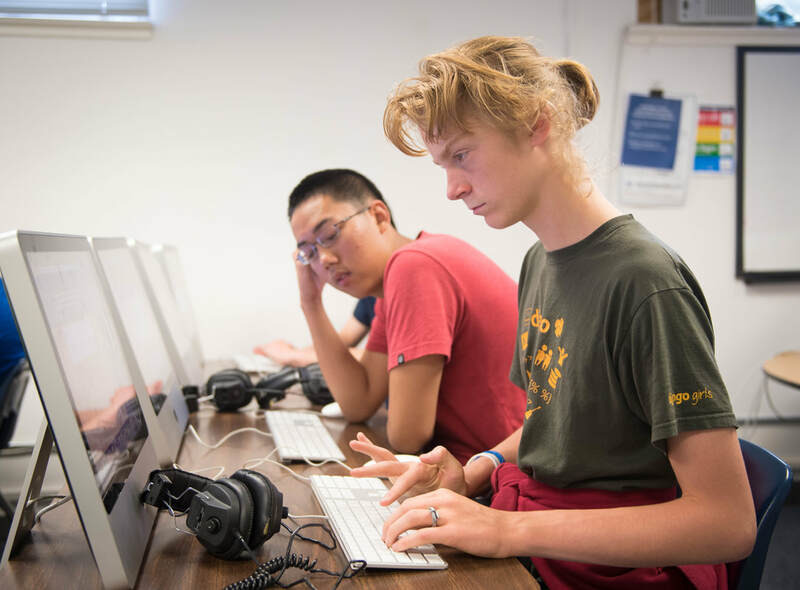 During a typical day on campus you may observe students creating engaging social studies presentations in Adobe Spark on their Chromebooks, composing songs in GarageBand on iPads in a music class and mirroring their work using Apple TV, dictating a fictional story they’ve created in a literature class using speech-to-text functionality in Google Docs, or programming a Sphero robotic ball to navigate an obstacle course in the Stanbridge Technology Lab. Our program focuses on both the development process as well as the final outcome of project work, encourages creativity, innovation and risk-taking, and strengthens executive functioning in the planning and execution of projects. Our classrooms are equipped with large screens, Apple TV devices and iPads for teacher use, and teachers access cutting-edge software and apps such as Inspiration, Adobe Spark, and Seesaw to foster multi-sensory learning. We are also equipped with campus-wide, high-speed WiFi access. Stanbridge works with Star 360, a computerized assessment tool, to support students in mastery of state-specific learning standards for reading, math and early literacy. The tool adjusts the difficulty of questions based on student responses and provides valuable student growth data to our staff within 20 minutes of completion. Stanbridge utilizes individualized programs, such as Learning A–Z, Bookshare, Step Up to Writing, and other software to strengthen fluency in reading and build decoding, reading comprehension and writing skills. Students master keyboarding and are introduced to speech-to-text software to dictate their writing. To support students in developing math skills, we use Prodigy, Starfall, and a number of iPad apps as well. We also employ personal digital assistants in the classroom (such as Amazon Echo) to function as research aids and provide spelling support, timers, reminders, etc. Each student is assigned a Stanbridge domain Gmail account which provides access to Google Drive, Calendar, and other G-Suite applications. Stanbridge adopted Google Classroom schoolwide to simplify the assignment, collection, and grading of student work and increase student-parent-teacher communication. We utilize QuickSchools, a cloud-based school management software program, to manage attendance, student information, and transcripts. Our staff uses Emote, a cloud-based software program that empowers staff to monitor and measure school climate and student social-emotional health in real-time. You can read more about the Emote program on our Counseling page. Stanbridge has established a new program for the 2018–2019 school year to train parents/guardians to use many of the same applications that students are working with in class. This allows parents to stay abreast of what students are engaging in at school and share in the learning process with their children. ​Stanbridge students also have the opportunity to use hands-on technology in our newly-renovated Design Lab. Following the principles of the Maker Faire movement, Stanbridge's Design Lab is a showcase of invention, creativity, and resourcefulness where students show what they are making, and share what they are learning. Students are often allowed to think and design creatively on projects of their own invention, while also working on specific pieces that highlight ingenuity and outside-the-box thinking, such as making cigar box guitars and building "battle bots."